Even though she didn't care about getting into Group B, Aylee decided to sleep in the morning due to frustration. Boggarts. Again! She groaned even when she thought of the word. Her worst fear would soon turn into Boggarts if Defence Against the Dark Arts kept this up. She didn't even know what her worst fear would be now. Dogs and loneliness, that was what she had faced up till now. "Agh!" she exclaimed, throwing her pillow against the wall when she woke up. Then she took in a deep breath, and tried to calm down. Stop over-reacting. Right, like she could do that. She threw her head into the pillow and then ended up sleeping. After some time, she was woken up by her nightmares (again), but she had gotten used to them so she wasn't bothered as much. But still, Aylee stood up and got out of her bed, deciding that she should do something useful today. It was an upsetting feeling because she sheets were really warm and comfortable. Another reason for why she wanted to sleep in. Checking the time, she figured it must be around one, one in the afternoon? She shrugged, tied her hair into a side-ponytail, put on a jumper and comfty boots as it was cold outside, got her schoolbag and left the girl's dormitories. She got out of the common room all right. She sighed as she started climbing down the stairs, or maybe jumping down the stairs. Aylee liked jumping down each step for some reason. A habit she had from when she was young. She blamed her brother Ethan for that. Well, she ended up going to the library, but seeing the many books that there were caused her to turn around and walk out of the castle. She needed some fresh air, anyway. The sun was shining brightly and whatever. Without thinking about it, her feet led her towards the Owlery. That was good, right? She needed to visit her owl, anyway, and write a letter. Aylee climbed up the steps to the Owlery and entered the room full of owls. "Julia!" she called, and a loud chirp made her look up. Her owl was eating. She laughed and then found a birdpoop-less spot to sit on. Then she took out her quill and parchment and started to write a letter to her brother Ethan. Usually it was her mother she wrote to, but this time she wanted to talk to her older brother. She wrote about everything so far, the new DADA Professor, how much she disliked him, how Kynan got detention, how she met up with Morgana, how she talked to little Elita, the new Professors of Hogwarts, practically everything. In the end, she ended up with three pieces of parchment of writing. She folded them, then put them into an envelope and sealed it. Then Aylee stood up and called for her owl, which soon came swooping down. "I've got a letter for you to deliver," she told her pet owl, as she tied the letter around its' leg. "Don't send it to my mother, this is for my brother Ethan. You know, the one who stole my Pringles last summer?" Julia let out a loud hoot, as if understanding her words. She grinned. Having looked for Aylee throughout most of the castle, Ryland finally decided to look for her outside. He made his way to the many courtyards but found only students he didn't know, so he walked away and found himself writing a letter to Phoenix in the Gryffindor Common Room. It didn't say much other than they were fine and were excited for the holiday, even though school had barely started. "I'm ready to get out..." he murmured as he walked out of his common room and in the direction of the Owlery. Rich, his ferret, walked beside him. Rich had stayed with him his first year, but the rest of the school years he had stayed with Phoenix. It was nice to have him back, though. Ryland needed the company. As they walked up the thousands and thousands of stairs, Rich made a funny sound which made Ryland laugh a little too loudly. His laugh made Rich run to him, climbing on his back to rest on his shoulder. Ryland walked the remaining steps while telling the little animal about his crazy classes. Had he been a girl he might have gasped as he saw the only other person in the Owlery. Had the world gone mad? Glancing quickly at Rich, the ferret climbed down and stayed by his side, shy about meeting new people. "Hey Aylee." Ryland greeted her with a smile as he walked over to where Jacques usually rested. Lucy's golden owl flew out to meet him, and he held out the letter for him to take. "Take that to Phoenix." he smiled as the bird flew out, but Ryland quickly turned his attention to Aylee again, almost forgetting about Rich until he climbed up his back again. A laugh caused Aylee to turn around, confused, but there was no-one else in the room. Probably someone climbing up the stairs. But the loud laugh seemed really familiar, she just couldn't remember where from... maybe she was thinking too much. Sighing, she nodded at her owl and watched it as it flew out of the window and... away. She stood there and watched Julia disappear from the view until she heard a voice. She knew that voice almost too well. As soon as the door to the Owlery opened, Aylee jumped and turned around. "'Ello Ryland!" she greeted her friend cheerfully. Too cheerfully, maybe. Given what happened last term at the Halloween Party, it felt awkward for her. Also about the Clock Tower scene. And that one time in front of the Ravenclaw Tower. If she was alone that moment, she would have totally just face-palmed herself for thinking of those moments. As Ryland's owl flew off, Aylee noticed a small animal climb up his back. "Erm, Ryland?" she asked, raising her eyebrows in a way that made her face look funny. "You have a ferret on your shoulder." 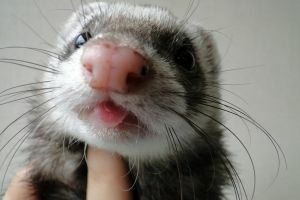 She grinned, not realizing that the ferret was Ryland's pet. Ryland let out a laugh. "Yeah, I noticed." he looked at Rich, still smiling at Aylee's comment. "What's that Rich?" he tilted his head closer to the gray ferret, as if trying to listen to a tiny voice coming from the animal. "You want to know who this beautiful girl is?" He had said the this line almost automatically, not caring about whether or not it would embarrass him. He'd been wanting to talk to Aylee that whatever he said now was simply going to come out naturally. He would technically speak his mind. Ryland turned to Aylee as Rich clung to him. "He's shy." he smiled. As Ryland laughed, Aylee grinned. Well, she seemed to be learning something new everyday. Ryland had a pet ferret. Rich, she thought as Ryland leaned in doing that, 'what's that you're saying?' trick. Her parents had done it on her a countless of times when she was young, to convince her that her soft-toys wanted her to go to sleep. After a while, you'd notice that it was just a trick (even if you were five!) and that it was only the person who was speaking was the one pretending that toys and animals could speak. The person speaking was always the one speaking out their thoughts. Okay, so the person speaking thinks you're beautiful, Aylee thought as soon as she heard it. Well, another situation where she didn't know what to do. Her life seemed to be full of that now, didn't it? She knew that it was a compliment, but she never took a compliment like that. In her mind, she wasn't beautiful. According to her insecure self, anyway. Right. Instead of saying anything, she just looked away, feeling her face grow warm. Shyness. Oh god. And you're not sure that he likes you, she thought to herself angrily. He practically just admitted it! Aylee ignored her own thoughts and tried to forget Ryland's last sentence. So she just blurted out, "He's really cute." Then, deciding to say something else, she asked, "Why do you call him Rich?" Right, change the subject. Very nice. "I don't know, actually." Ryland replied, a feeling of frustration going through his body. Why can't I just be normal and not make anyone feel awkward? He had had a moment of bravery, he was having those often, but he had made Aylee turn away and blush. Thinking his comments had made her feel uncomfortable, he secretly cursed himself for it. He had simply wanted to give her self-esteem a boost and he had failed miserably. Again. He thought about his answer more thoroughly. "I guess it's because I knew a boy called Rich once, but he left before I did. It was back at the orphanage." he attempted to smile though it turned out to be more of a strange kind of smile. Suddenly, he remembered why he had been looking for Aylee all day. "Hey, so I want to ask you something." he began, "For Professor Elldir's class...well, I got into Group A and I'm allowed to bring someone for a party or get-together." What am I doing? What am I doing? He glanced at Rich briefly, gathering strength from the ferret's small black eyes. "I was wondering if you'd like to go with me...?" He blurted out. Ryland rarely spoke quickly, therefore it felt strange to do it for the first time in front of Aylee. In fact, it was usually her that spoke faster than possible. "Was he a friend?" Aylee asked about Rich's story. She had been under the impression that Ryland had no friends back at the orphanage. Then again, she didn't know a lot of things about Ryland, did she? At least he had a reason for naming his ferret Rich. Aylee had named her owl Julia simply because it reminded her of a character from one of her favourite books. Not exactly a good reason. She leaned against the wall of the Owlery just as Ryland smiled. Awkwardly, she smiled back. Then Ryland said that he wanted to ask her something. "Sure," Aylee replied, and shrugged. The way Ryland started the question, about getting into Group A, made her want to hit her head against the wall. Another reminder that she had not gotten into Group A. Seriously, what had she done wrong in her homework? She answered the questions well, and for the opinions bit she had written everything honestly. The only thing she hadn't done what the part where they were supposed to give their blood status. She had left that out. Other than that, that homework was one of her best works. Due to her arguing with herself, she didn't catch anything else from the sentence. Then, Ryland asked her if she wanted to go with him. It was strange because he seemed to be speaking really fast. "W-wait, where?" Aylee asked, then realized that the question probably made her sound like an idiot. Ryland sighed. "Sort of." He wasn't very good friends with Rich when they were younger. They were picked on together but that's the only thing that made them stay close. Or at least that's what he thought. Why else would Rich stay by his side if not because they were alike? Ryland turned to the ferret and it climbed down, playing with whatever he could find. Ryland almost slapped himself. Had Aylee really not heard a word he had said? Was he annoying her this badly that she wasn't even paying attention to him anymore? Why did he even come up here anyway? "Um. To the DADA Party?" Not knowing what to do, Ryland turned away for a second, getting his toughts straight. Then, he realized maybe Aylee didn't want to go with him. After all, he wasn't the only guy who had tried to woo her with flowers. Evan had done the same. Of course Aylee won't want to go with you! You're practically a dog! And you attacked her! "It's okay if you don't want to. I just thought...since we know each other...it'd be fun. But don't worry about it. It's okay." What was he saying now? What if she wanted to go with him and now he had made her think he was only asking to be nice? "Oh, er, no!" Aylee blurted out. Now she was speaking fast again. "No, um, I mean, I'd love to go with you!" Did she sound desperate now? Ryland was seriously going to slap himself. "Aylee...." he began. What had he said? What had she said? It seemed that now, this last few years, he had become and expert into getting himself in trouble. "Aylee. Yes, I meant it to be a date." he was practically panicking internally now. "I mean, I like you." Oh my...what? Had those words come out of his mouth? "I mean, you're incredible. I honestly can't see myself going to the party with anyone else." It was about the most real thing Ryland had said in the last few days. In fact, it was the only true thing he'd said. Right. Well, that was set straight then. Now Aylee knew that Ryland liked her. Less confusion now, right? Right? Now she could be totally sure. Except no, it seemed that there was more confusion now. Because now she didn't know what to say. No idea. No idea at all. How did a person usually respond to such words? She was racking her brains, trying to think of something, anything, to say. "Oh, okay," was the only thing she found her voice reply. Her face was still red as she was trying to think of the reasons of why she was 'incredible', as Ryland said. She couldn't think of one. All she was thinking of was about the butterflies in her stomach. Tell him that you like him back! Only, she couldn't. She couldn't find the words to. And she couldn't run away without making things awkward again. As usual. Was she always so stubborn? Aylee didn't speak for a few moments and then said, in a small voice, "Er, thanks." "Okay?" Ryland asked, no sure what that meant. He had just said he liked her, really liked her, and all she did was say okay. He was done with these kind of women. "You're welcome. I suppose." he added. Next thing he knew, he was calling Rich to come back. "So I'll meet you at the party then?" he wasn't sure of what he had done, or what he would do from now on. Either way, he let it out and that meant a heavy weight had been lifted off his shoulders. "I guess I'll go now." He gave her a small smile. "Oh yeah, er, sure," Aylee replied, still not being able to find the right words to say. What could she say without offending Ryland? She must've already did. He looked upset. I must sound really rude... she realized. Yet all she did was smile back. "Yeah, see you there."